AN engine problem is being blamed for a mid-flight scare on a flight from Alice Springs to Brisbane which had some passengers fearing for their lives. 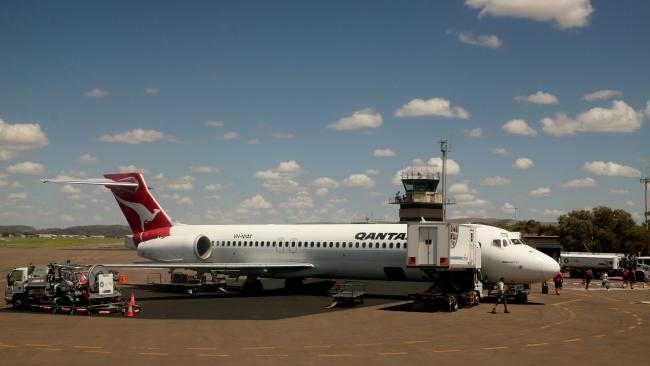 The Boeing 717 flight QF1799 took off from Alice Springs at 2.30pm local time today, an hour and 20 minutes after it was scheduled to depart. Witnesses on-board reported hearing a loud bang before the plane began to shake shortly before landing. One passenger claimed they were told to brace, and were sending goodbye messages to loved ones, while the crew briefed one man on how to operate the emergency door on the aircraft. However Qantas has downplayed the incident and has firmly refuted claims that passengers were told to use the brace position. Tonight a Qantas spokeswoman told The Courier-Mail the aircraft didnâ€™t need to make an emergency landing but was given a priority landing at the airport, where the plane was met by emergency services crews as a precaution. â€œThe pilots followed standard procedure, shut down the engine, and the flight landed normally in Brisbane at 6pm. Passengers disembarked shortly after,â€? she said. Passengers cheered on the Qantas crew after the landing. Engineers are now inspecting the aircraft.